For protection in wet, cool conditions this 3-in-1 jacket pairs a waterproof shell with an warm, ultra-soft fleece liner jacket. She can wear both snapped together on rainy days or separately as weather permits. We are named for the coldest, most unforgiving side of a mountain. We have helped explorers reach the most unfathomable heights of the Himalayas. But The North Face legend begins, ironically, on a beach. More precisely, San Francisco's North Beach neighborhood, at an altitude of only 150 feet above sea level. It was here in 1966 that two hiking enthusiasts resolved to follow their passions and founded a small mountaineering retail store. From the beginning, the brand committed to serving all those who desired to explore and to serving our natural wild lands by helping to conserve them. At our core, we believe exploration creates an indelible bond with the outdoors, inspiring people to protect our land and pass these beliefs down to the next generation. 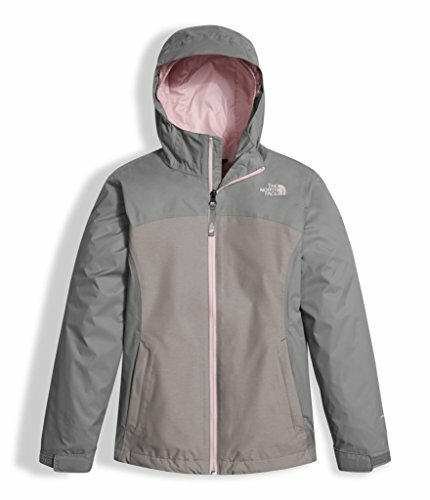 3-in-1 jacket pairs a waterproof shell with an warm, ultra-soft fleece liner jacket. Fixed hood. Waterproof, breathable, fully seam sealed. Snap-in compatible. Zip hand pockets on outer jacket. Adjustable drawcord system at hem. Adjustable cuff tabs. Cozy high-pile Sherpa fleece liner jacket. Adjustable cuff tabs. Cozy, high-pile raschel fleece liner jacket. ID label. Logo on front and back of outer jacket. Embroidered logo on front of liner jacket.